*all schools are site-based. So the district office gives recommendations, but the schools (principals) have the final say. This applies to devices chosen, professional development, discipline policies, etc. *Phase 1 (February 2012) – grades 5, 6 and 1/3 of each high school (based on student population, ~26 teachers at my school). Phase 2 (August 2012) – grades 4, 7 and next 1/3 of HS. Phase 3 (TBD 2013) – grades 3, 8 and last 1/3 of HS. At this point high schools MAY allow devices to go home instead of classroom sets. *Before we ever saw our Chromebooks, our Integration Technology Specialist (ITS) (Tami) had her work cut out for her! She received over 700 Chromebooks. 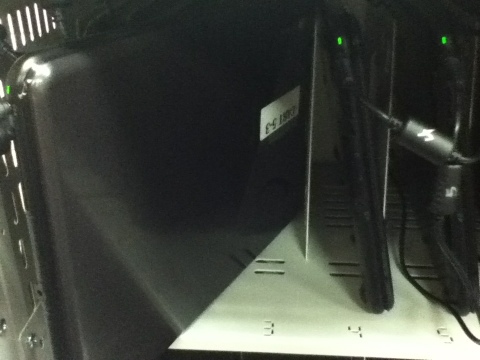 Each one was assigned to a class set (district asset & serial numbers were recorded), set up to the network (we have a special Chrome wireless network), labeled and inserted into a cart. *Tami created (and shared) a google document with all of this information so that we (teachers) could assign Chromebooks to students (my students use the same CB every day). The original spreadsheet includes information for all teachers. *Tami started holding professional development for the 1:1 teachers at my HS in late fall. We received our locked carts in nid-February. We were required to attend a full day of PD on March 1st to obtain the code to unlock our carts. Unfortunately we didn’t get to all of the following agenda (everything took much longer than anticipated!). I helped present the session on “Unlocking the Chromebook Power” using an adapted version of my SCLFTA presentation. *The morning was spent determining which CB numbers (1-27 for my cart) matched the asset tag info that Tami collected (see above spreadsheeet). I exported rosters from my PowerSchool gradebook then copied and pasted my students names and ID numbers into a Google spreadsheet for each class. I then assigned each student to a number (alphabetical order) and converted their ID numbers to email addresses. *This full day of PD was priceless because we were given useful information and the TIME to do things that we needed to do. I adapted my rules presentation (from Tami) and my user agreement. *Among other information, we also viewed and discussed the discipline policy. As we go 1:1, I think it is extremely important to have consistent consequences and hold students accountable. Below is an example from another high school in our district.